Controlling your home with just the touch of a button might seem like something you’d see in a sci-fi movie or The Jetsons, but it has become a reality with today’s technology. Today, smart homes are on the radar, and controlling your home's security and environment has become easier than ever before. Competition in this area of technology is fierce. Just about every major tech company has a device available including companies like AT&T, Comcast, and even Google. Samsung has thrown its hat into the ring with the SmartThings home monitoring system...arguably the easiest to install and use of all DIY home security systems on the market. If you’ve never heard of or used the SmartThings home monitoring system, you may not know exactly what it does. The SmartThings is a "smart hub" or home monitor that allows you to control many aspects of your home and your life, all from a simple-to-use app on your smartphone. With this hub in your home, you can command things like lights, electronics, some of your appliances, thermostats, your doors and more. In fact, Samsung has gone out of its way to make sure their system compatible with over one hundred devices, making it much more useful for consumers than most of the other smart hubs out there. SmartThings uses an IFTTT system to create routines to do various things at various times. For example, you can create a "Good Morning!" routine in the app that turns on the lights and lowers the thermostat at 6:00 am. On the other hand, a "Good Night!" routine turns the lights off, lowers the thermostat, and checks to make sure all the windows and doors are locked at 9:00 pm. You can also set up your "Goodbye!" mode, which will alleviate any unnecessary automated actions while you're away. The system can send alerts and text messages if windows or doors are opened, when a movement is detected in the home, or if your internet is disconnected. You’ll also be able to control the temperature, door locks, and lights while you’re at work if you need to. This means there’s never a need to worry if you forgot to turn off the stove ever again. To check, simply open the app and turn it off if you have to. Alerts are also sent in real time allowing you to respond quickly when dealing with problems such as fires or water leaks. The SmartThings V2 hub adds a few new features to the original. One of the most popular new features is video streaming which uses the Samsung Smart Cam. The V2 has two built-in USB ports that allow you to add on to the system. It comes with embedded Bluetooth LE radio that connects the hub to more devices like Samsung Smart Appliances, Honeywell Thermostats, August Locks, Chamberlain garage door openers, Netgear cameras and more. 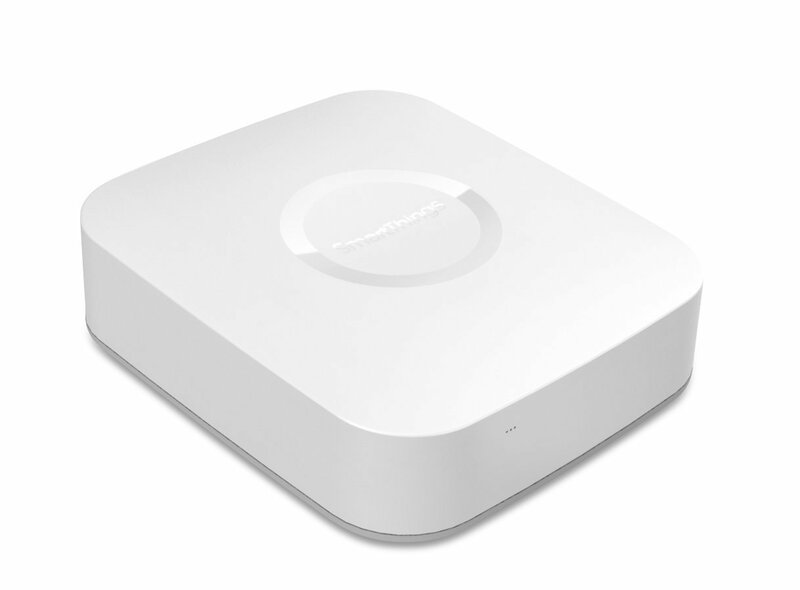 The SmartThings V2 hub also supports other protocols including Z-Wave and Zigbee compatibility and comes with a battery backup that uses four AA batteries and lasts about 10 hours. These new sensors are about one third the size of the originals, making them even sleeker than their predecessor. With this sleek design comes the possibility of future upgrades and the ability to work locally or in the cloud. In the future, SmartThings may add cellular backup functionality so that you stay connected even when the internet is out. The initial set up for the SmartThings V2 is fairly easy. You’ll first have to connect your hub to your home network using the hub’s Ethernet port. Afterward, you’ll download the app for your smartphone. Unlike many other smart home monitors, the SmartThings hub offers an app for Android and iOS. Once you download the app, you’ll need to create a SmartThings cloud account. Setting up the system only takes a few minutes, and you’ll be able to start adding your devices and create automation rules for them in no time at all. If you are migrating from the V1 hub, things might be slightly more complicated. Migration is not necessarily difficult, but it can become a lengthy and tedious migration to perform. A clean migration means uninstalling all of your smart apps, then all of your SmartThings app routines. This will reset the app and you’ll have to install the new hub and then reinstall all of your smart apps and create new routines. But the extra work is worth it because the V2 is compatible with so many devices, giving it the potential to be a completely comprehensive smart home solution. 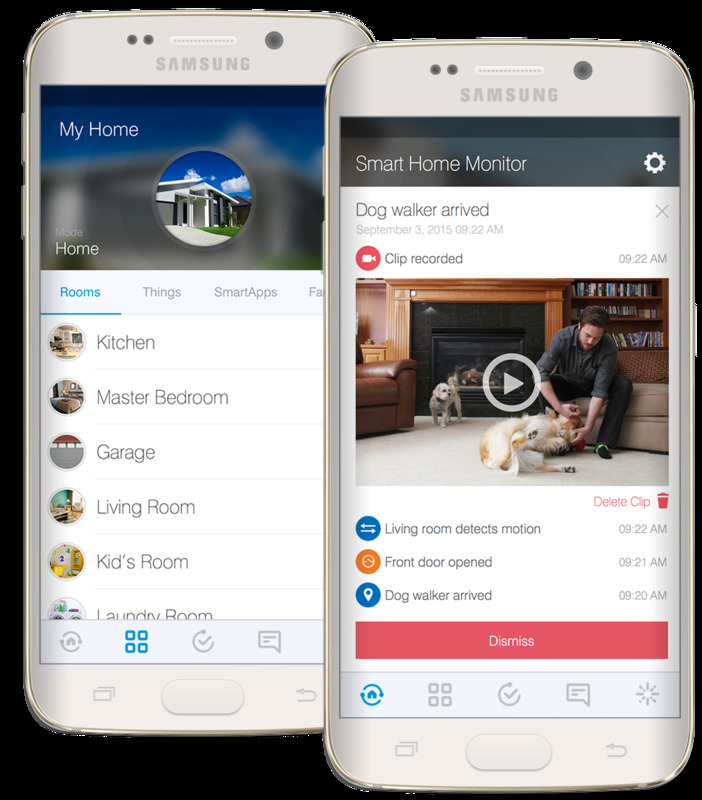 Another benefit of the Samsung SmartThings home monitoring system is the user community. The device has an IDE, or Integrated Development Environment, that is web-based. This IDE uses the Groovy programming language, allowing users to create third-party automation rules. These rules can allow you to expand the use of the base program, giving you much more functionality. You can also create your own rules and share them with the IDE. If there’s something you want but can’t find, you may be able to get help creating it from the community or have someone create it for you. The Samsung community is very helpful. The SmartThings V2 home monitoring system is an affordable DIY option that allows you to connect to a number of devices in order to customize your home security. It also allows you to create a variety of automation rules that you can activate from your smartphone or schedule to occur on a daily basis as your specific lifestyle requires. It connects to iOS, Android and works with the Apple watch as well as the Amazon Echo. Although it does require an internet connection for many of the rules you can create and direct control of the device, the SmartThings V2 is a robust system that allows you to enjoy a truly connected smart home that you can control with the touch of a button.